Fra Angelico (c. 1395 - February 18, 1455), born Guido di Pietro, was an Early Italian Renaissance painter, referred to in Vasari's Lives of the Artists as having "a rare and perfect talent". Known in Italy as il Beato Angelico, he was known to his contemporaries as Fra Giovanni da Fiesole (Brother John from Fiesole). In Giorgio Vasari's Lives of the Artists, written prior to 1555, he was already known as Fra Giovanni Angelico (Brother Giovanni the Angelic One). Within his lifetime or shortly thereafter he was also called Il Beato (the Blessed), in reference to his skills in painting religious subjects. In 1982 Pope John Paul II conferred beatification, thereby making this title official. Fiesole is sometimes misinterpreted as being part of his formal name, but it was merely the name of the town where he took his vows, used by contemporaries to separate him from other Fra Giovannis. He is listed in the Roman Martyrology as Beatus Ioannes Faesulanus, cognomento Angelicus-"Blessed Giovanni of Fiesole, nicknamed Angelico". But it is impossible to bestow too much praise on this holy father, who was so humble and modest in all that he did and said and whose pictures were painted with such facility and piety. Fra Angelico was born Guido di Pietro at Rupecanina, in the Tuscan area of Mugello, near Fiesole towards the end of the 14th century and died in Rome in 1455. Nothing is known of his parents. He was baptized Guido or Guidolino. The earliest recorded document concerning Fra Angelico dates from October 17, 1417 when he joined a religious confraternity at the Carmine, still under the name of Guido di Pietro. This record also reveals that he was already a painter, a fact that is subsequently confirmed by two records of payment to Guido di Pietro in January and February 1418 for work done in the church of Santo Stefano del Ponte. The first record of Angelico as a friar dates from 1423, when he is first referred to as Fra Giovanni, following the custom of those in Holy Orders of taking a new name. He was a member of the Observant Branch of the Dominican Order at Fiesole. Fra, an abbreviation of frate (from the Latin frater), is a conventional title for a friar or brother. Fra Angelico initially received training as an illuminator, possibly working with his older brother Benedetto who was also a Dominican. His illumination tutor is unknown. San Marco in Florence holds several manuscripts that are thought to be entirely or partly by his hand. The painter Lorenzo Monaco may have contributed to his art training, and the influence of the Sienese school is discernible in his work. He had several important charges in the convents he lived in, but this did not limit his art, which very soon became famous. According to Vasari, the first paintings of this artist were an altarpiece and a painted screen for the Carthusian Monastery of Florence; none such exist there now. From 1408 to 1418 Fra Angelico was at the Dominican Convent of Cortona where he painted frescoes, now destroyed, in the Dominican Church and may have been assistant to or follower of Gherardo Starnina. Between 1418 and 1436 he was at the convent of Fiesole where he also executed a number of frescoes for the church, and the Altarpiece, deteriorated but restored. A predella of the Altarpiece remains intact in the National Gallery, London which is a superb example of Fra Angelico's ability. It shows Christ in Glory, surrounded by more than 250 figures, including beatified Dominicans. In 1436 Fra Angelico was one of a number of the monks from Fiesole who moved to the newly-built convent of San Marco in Florence. This was an important move which put him in the centre of artistic activity of the region and brought about the patronage of one of the wealthiest and most powerful members of the city's Signoria, Cosimo de' Medici, who had a large cell (later occupied by Savonarola) reserved for himself at the monastery in order that he might retreat from the world. It was, according to Vasari, at Cosimo's urging that Fra Angelico set about the task of decorating the monastery, including the magnificent Chapter House fresco, the often-reproduced Annunciation at the top of the stairs to the cells, the Maesta with Saints and the many smaller devotional frescoes depicting aspects of the Life of Christ that adorn the walls of each cell. In 1439 he completed one of his most famous works, the Altarpiece for St. Marco's, Florence. The result was unusual for its times. Images of the enthroned Madonna and Child surrounded by saints were common, but they usually depicted a setting that was clearly heavenlike, in which saints and angels hovered about as divine presences rather than people. But in this instance, the saints stand squarely within the space, grouped in a natural way as if they were able to converse about the shared experience of witnessing the Virgin in glory. Paintings such as this, known as Sacred Conversations, were to become the major commissions of Giovanni Bellini, Perugino and Raphael. In 1445 Pope Eugenius IV summoned him to Rome to paint the frescoes of the Chapel of the Holy Sacrament at St Peter's, later demolished by Pope Paul III. Vasari claims that at this time Fra Angelico was offered by Pope Nicholas V the Archbishopric of Florence, and that he refused it, recommending another Friar for the position. While the story seems possible and even likely, if Vasari's date is correct, then the pope must have been Eugenius and not Nicholas. In 1447 Fra Angelico was in Orvieto with his pupil, Benozzo Gozzoli, executing works for the Cathedral. Among his other pupils were Zanobi Strozzi. In 1455 Fra Angelico died while staying at a Dominican Convent in Rome, perhaps in order to work on Pope Nicholas' Chapel. He was buried in the church of Santa Maria sopra Minerva. Fra Angelico was working at a time when the style of painting was in a state of change. This process of change had begun a hundred years previous with the works of Giotto and several of his contemporaries, notably Giusto de' Menabuoi, both of whom had created their major works in Padua, although Giotto was trained in Florence by the great Gothic artist, Cimabue, and painted a fresco cycle of St Francis in the Bardi Chapel in Santa Croce. Giotto had many enthusiastic followers, who imitated his style in fresco, some of them, notably the Lorenzetti, achieving great success. The patrons of these artists were most often monastic establishments or wealthy families endowing a church. Because the paintings often had devotional purpose, the clients tended to be conservative. Frequently, it would seem, the wealthier the client, the more conservative the painting. There was a very good reason for this. The paintings that were commissioned made a statement about the patron. Thus the more gold leaf it displayed, the more it spoke to the patron's glory. The other valuable commodities in the paint-box were lapis lazuli and vermilion. Paint made from these colours did not lend itself to a tonal treatment. The azure blue made of powdered lapis lazuli went on flat, the depth and brilliance of colour being, like the gold leaf, a sign of the patron's ability to provide well. For these reasons, altarpieces are often much more conservatively painted than frescoes, which were often of almost life-sized figures and relied upon a stage-set quality rather than lavish display in order to achieve effect. 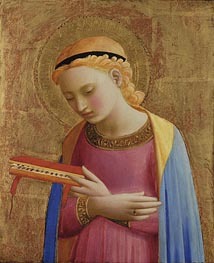 Fra Angelico was the contemporary of Gentile da Fabriano. Gentile's altarpiece of the Adoration of the Magi, 1423, in the Uffizi is regarded as one of the greatest works of the style known as International Gothic. At the time it was painted, another young artist, known as Masaccio, was working on the frescoes for the Brancacci Chapel at the church of the Carmine. Masaccio had fully grasped the implications of the art of Giotto. Few painters in Florence saw his sturdy, life-like and emotional figures and were not affected by them. His work partner was an older painter, Masolino, of the same generation as Fra Angelico. Sadly Masaccio died at 27, leaving the work unfinished. The works of Fra Angelico reveal elements that are both conservatively Gothic and progressively Renaissance. In the altarpiece of the Coronation of the Virgin, painted for the Florentine church of Santa Maria Novella, are all the elements that a very expensive altarpiece of the 14th century was expected to provide- a precisely tooled gold background, lots of azure, lots of vermilion and an obvious display of arsenic green. The workmanship of the gilded haloes and gold-edged robes is exquisite and all very Gothic. What make this a Renaissance painting, as against Gentile da Fabriano's masterpiece, is the solidity, the three-dimensionality and naturalism of the figures and the realistic way in which their garments hang or drape around them. Even though it is clouds these figures stand upon, and not the earth, they do so with weight. The series of frescoes that Fra Angelico painted for the Dominican Brothers at San' Marcos realise the advancements made by Masaccio and carry them further. Away from the constraints of wealthy clients and the limitations of panel painting, Fra Angelico was able to express his deep reverence for his God and his knowledge and love of humanity. The meditational frescoes in the cells of the convent have a quieting quality about them. They are humble works in simple colours. There is more mauvish-pink than there is red while the brilliant and expensive blue is almost totally lacking. In its place is dull green and the black and white of Dominican robes. There is nothing lavish, nothing to distract from the spiritual experiences of the humble people who are depicted within the frescoes. Each one has the effect of bringing an incident of the life of Christ into the presence of the viewer. They are like windows into a parallel world. These frescoes remain a powerful witness to the piety of the man who created them. Vasari relates that Cosimo de' Medici seeing these works, inspired Fra Angelico to create a large Crucifixion scene with many saints for the Chapter House. As with the other frescoes, the wealthy patronage did not influence the Friar's artistic expression with displays of wealth. Masaccio ventured into perspective with his creation of a realistically painted niche at Santa Maria Novella. Subsequently, Fra Angelico demonstrated an understanding of linear perspective particularly in his Annunciation paintings set inside the sort of arcades that Michelozzo and Brunelleschi created at San' Marco's and the square in front of it. In their bearing and expression, the saints painted by Fra Angelico come nearer to the truth than the figures done by any other artist. It is probable that much of the actual painting was done by his assistants to his design. Both Benozzo Gozzoli and Gentile da Fabriano were highly accomplished painters. Benozzo took his art further towards the fully developed Renaissance style with his expressive and life-like portraits in his masterpiece of the Journey of the Magi, painted in the Medici's private chapel at their palazzo. Through Fra Angelico's pupil Benozzo Gozzoli's careful portraiture and technical expertise in the art of fresco we see a link to Ghirlandaio, who in turn painted extensive schemes for the wealthy patrons of Florence, and through Ghirlandaio to his pupil Michelangelo and the High Renaissance. Apart from the lineal connection, superficially there may seem little to link the humble priest with his sweetly pretty Madonnas and timeless Crucifixions to the dynamic expressions of Michelangelo's larger-than-life creations. But both these artists received their most important commissions from the wealthiest and most powerful of all patrons, the Vatican. When Michelangelo took up the Sistine Chapel commission, he was working within a space that had already been extensively decorated by other artists. Around the walls the Life of Christ and Life of Moses were depicted by a range of artists including his teacher Ghirlandaio, Raphael's teacher Perugino and Botticelli. They were works of large scale and exactly the sort of lavish treatment to be expected in a Vatican commission, vying with each other in complexity of design, number of figures, elaboration of detail and skilful use of gold leaf. Above these works stood a row of painted Popes in brilliant brocades and gold tiaras. None of these splendours have any place in the work which Michelangelo created. Michelangelo, when asked by Pope Julius II to ornament the robes of the Apostles in the usual way, responded that they were very poor men. Within the cells of San'Marco, Fra Angelico had demonstrated that painterly skill and the artist's personal interpretation were sufficient to create memorable works of art, without the expensive trappings of blue and gold. 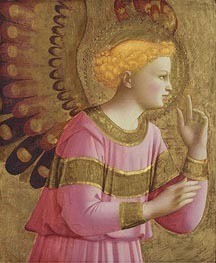 In the use of the unadorned fresco technique, the clear bright pastel colours, the careful arrangement of a few significant figures and the skilful use of expression, motion and gesture, Michelangelo showed himself to be the artistic descendant of Fra Angelico. Frederick Hartt describes Fra Angelico as "prophetic of the mysticism" of painters such as Rembrandt, El Greco and Zurbaran.